I found a recipe in one of my Junior League cookbooks years ago for Harvard Beets. I remember calling my mom to tell her how yummy they were, and she said my grandma Charlotte always used to make Harvard Beets. And my father-in-law went to Harvard Medical School, so I always think of both him and grandma when I make this recipe. This is a simple way to make a canned vegetable into a real side dish, and the beautiful red color looks very pretty on a holiday table. Drain beets, reserving juice. Add water to beet juice to make 2/3 cup. Combine cornstarch and salt in a saucepan. Add the beet liquid and vinegar, and stir until smooth. Cook, stirring constantly until mixture thickens and boils. Boil for 1 minute, stirring. It's like making pudding. You keep stirring and stirring and right when you think it will never get thick, it does. This mixture will turn from cloudy to clear when it thickens. Add sliced beets and sugar, heat through. This makes a sweet and sour beet that is delicious! I wonder why it's called Harvard Beets? Anyone know? For yummy recipes links, visit Rachel in the Land of Monkeys and Princesses. Not a fan of beets but I do love recipes that remind you of a loved one. Happy Thanksgiving! "The Land of Monkeys and Princesses"? Wow, that sounds like some incredible place. Fascinated by this beet thing. We have beetroot, but I've never seen anything like this. Frau - Those recipes are the best, I agree. Mo. - Beets and beetroot are the same thing I believe. Beets in this recipe are sliced and canned beetroot. 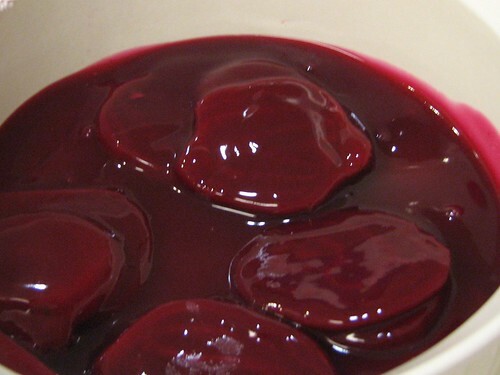 I love beets and I have had this recipe since my mom made it. THANKS!!! for the recipe. I think it's called Harvard Beets because only smart people are cultured enough to eat beets. Heather - Huh. I never knew the beet was a smarty-pants veggie. Maybe I'll make them more often!